An hour ago, Jan called me to let me know that he’s not going to mak it home before the early hours of the morning (he’s working on a paper, deadline midnight and needs access to the computers at work to run the tests he wants to write about). He’s been working on the paper for about a week now, so I wasn’t really expecting him home at a sensible time tonight, but the fact that he actually bothered to call put a huge smile on my face. While this may not seem like a big deal to many of you, his not calling is exactly the kind of thing we disagree on. We’ve agreed that, once our evening meal is ready, I won’t wait around too long for him, but will eat alone leaving his portion for him to heat up later, and while this means I get to eat at a sensible time, when he neither calls nor shows up I can’t help but feel it’s a case of out of sight, out of mind. He, on the other hand, says it’s not that he never thinks of me when I’m not there, he just loses track of time and it doesn’t occur to him that I’ll be cooking tea already. So him calling me as early as 6 o’clock is nothing short of a miracle. This comes on the heels of a bit of a mini breakdown on my part yesterday. I have to admit, I have slightly crap timing – Jan was actually doing some work for the aforementioned paper at the time and was about to get ready to go and meet his choir for a warm up before a festival they were performing at. But after being ignored by him nearly all morning, then catching him on a forum rather than actually working on the paper, I burst into tears, told him I wouldn’t be coming to his festival and stormed off for a shower. Yeah… it’s not exactly something I’m proud of. But… we talked, Jan said he had noticed my getting rid of things and preparing to move, and he does want me to stay, he just doesn’t know what he can do to make me want to do so, especially since he still can’t see his way to offering me any kind of long term commitment. And I told him it’ not like I’m looking for a marriage proposal… or even a commitment to stay with me forever without a bit of paper, but I want to feel that he’s at least willing to give us a proper try, not just drift along the way we have been doing. So, he has promised to try and show me that I am important to him, even if he can’t make a decision to save his life and I’ve promised to communicate more, and let him know what’s actually bothering me rather than saving it all up and letting everything out out once. That method only leads to arguments… and tears (mine, not his). So back we go, for another try. But he has said he wants me to stay… which isn’t quite the major decision I’ve been hoping for, but I feel it is a breakthrough, of sorts. Baby steps… And today, at least I get to go to bed happy. First things first… some photographs for those who requested them (or actually just answered my question with a yes, but you know what I mean…). 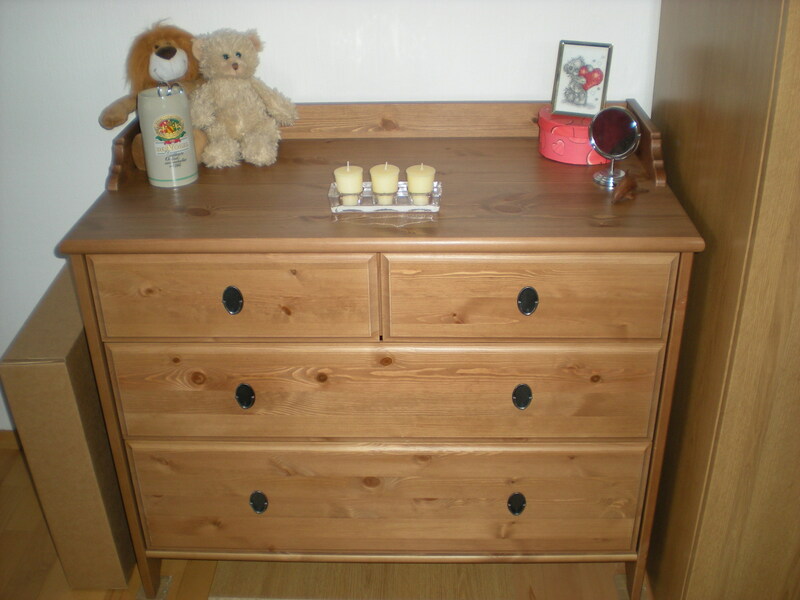 Photo one is the chest of drawers (well, duh! Talk about stating the obvious!). Currently looking very neat and tidy, but I’m sure it won’t be long before the same chaos that reigns on every other sufrace in the flat has made it on to there to. *sigh*. 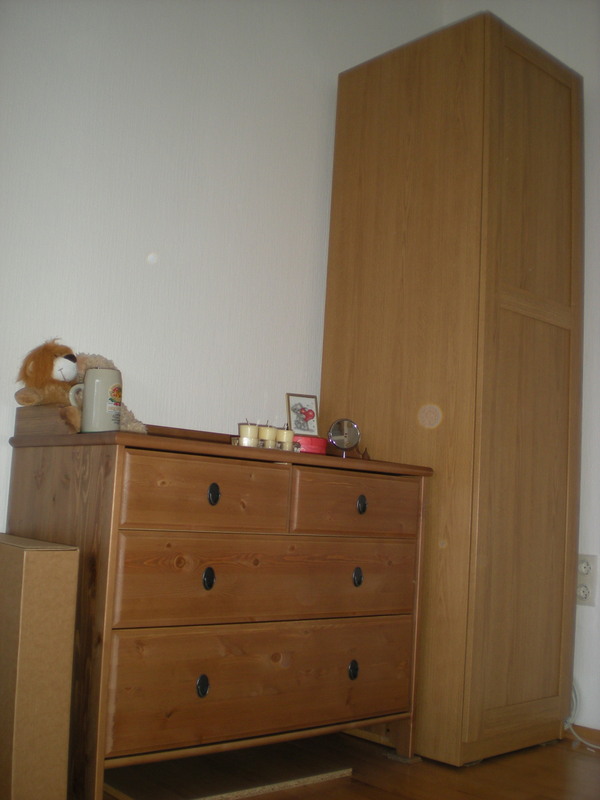 That cardboard box you see to the left of the drawers contains the bedside table. It was only put up yesterday and I was working on my dissertation all day so no photo yet I’m afraid. Moving on, and the chest of drawers has been joined by a wardrobe. Just a small one for now – we only really needed somehwere to hang stuff up since the drawers will do just fine fo things that can be folded. Eventually we’ll get a bigger (and probably slightly more expensive) wardrobe for our room in the new flat, but that wasn’t the purpose of this weekend’s mission. And that brings us to my final photo. 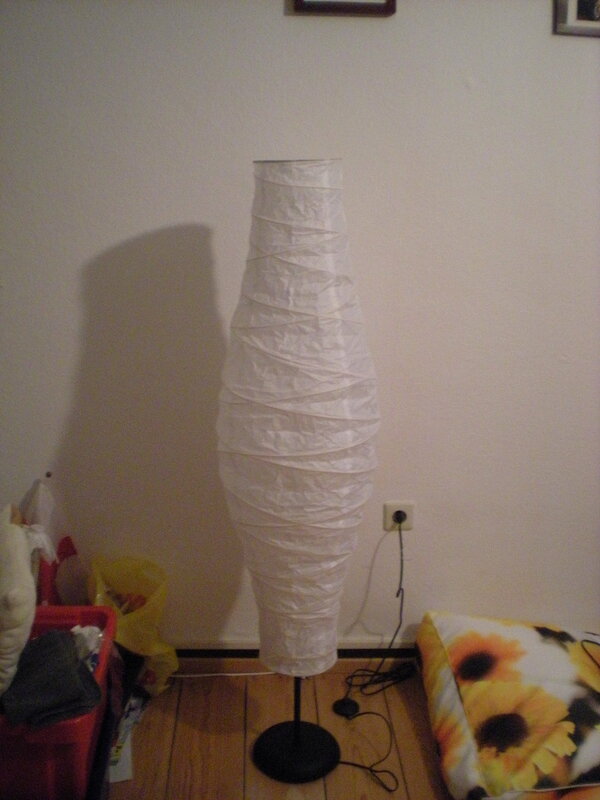 It’s a lamp! 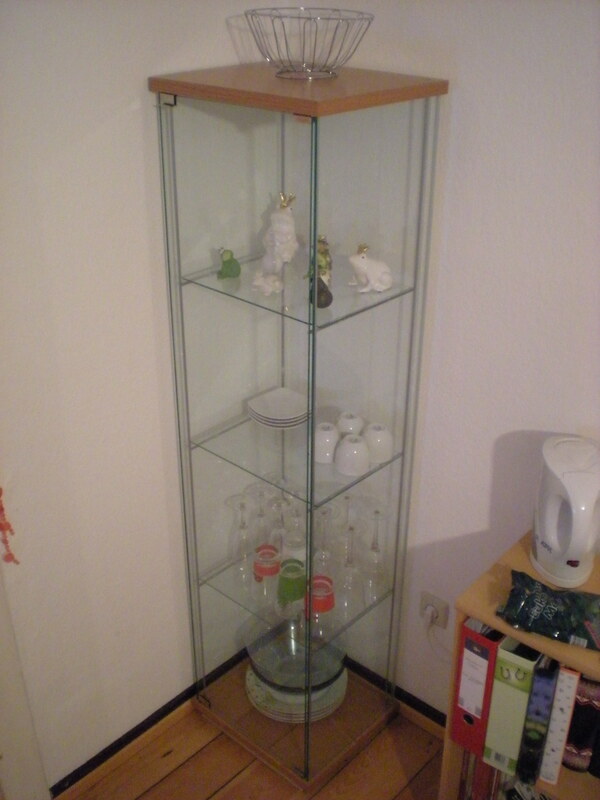 Eventually it’s place will be next to the sofa – which Jan will be bring with him from his flat. I actually can’t wait to have a sofa to snuggle up on! For now, though, the lamp has to be content with standing to one side of my living room, looking slightly lonely and out of place. And that, my friends, is that. Not bad for an afternoon’s shopping. And in other news, we had an appointment to look at another flat today. It was at 9:15 this morning, so I arranged to work from home today instaed of taking a half day and not starting til around 12 pm (and before you ask yes I did actually do work!). The flat was nice but would need a fair amount doing to it – like a proper kitchen putting in for one! – which of course would be expensive. Once again it all comes down to the money factor! We’l discuss it tonight though and I’m hoping a decision will have been made by Thursday at the latest. Stay tuned! I kind of had to tell my boss about the job interview today. He called me into his office to ask if I’d made my decision yet and when I said no he wanted to know why.Aarggh! I had no idea what to say! So I just told the truth. Then he was asking me what was so good about the other offer, or so bad about his. Then he said if they can’t be sure I’m going to take the job he can always advertise for someone else, becuase for him it doesn’t sound good. Oh man. Now I have a date for the interview – Thursday at 3:30pm – so tomorrow I have to go into work and ask for Thursday afternoon off. And whether I say it or not he’s going to know why. Eeep! Since I was already being honest when he asked me where the company is I figured there was no point in lying about that, so I told him. Stuttgart. To which he asked me if I really want to commute to Stuttgart every day. Well, that is one of the major factors against taking that job (if I’m even offered it!) The other one being that it will most likely pay less than he’s offering me. But it’s just translation, no project management. Although I think getting more project management probably isn’t a bad thing. And I can’t exactly run away and find a new job every time my work involves something I’m not that good at. Anyway, so now I feel… I don’t know. Slightly guilty I guess. I mean, he’s offering me this great opportunity and I’m putting off answering because I’m considering taking something not as good, which I haven’t even been offered yet and may not even be offered. It’s almost like saying his company isn’t good enough for me or something. But apart from that work was actually pretty good today. I guess now they’ve told me they want me to stay I’m less worried that I might be doing something wrong. So that would be a point in favour of staying I suppose. Ugh, I hate making decisions. Even about good stuff. Ooh, I also have other news! You see, today I was offered a proper job at the place I work. The contract would be for one year, following which I would be offered an ope-ended contratc, provided I still want to stay. All sounds very good, yes. Then I arrived home to find an email from the company I applied for a position of trainee translator at before Christmas. Guess what? They want me to come for an interview. So, what do I do? I have decided I will at least go to the interview at the new place, but that means taking a day off work. Do I tell the boss where I’m going? Even though he’s made me a definite job offer? And if I’m then offered the other job what do I do, where do I go? Aargh… it’s making my head hurt already and I haven’t even had the interview yet! 10 days from now I fly back to the land of my birth. That’s 8 more work days and one weekend to go. Ten days should feel like nothing but actually it’s looking incredibly long right now, probably because I’m tired. Maybe tomorrow it will seem closer – at least the number will be in single figures then. I also have 10 days to decide whether I’m moving out in March or whether to stay here for one more semester (until August) just in case. Umm, help? What do you do when you get up in the morning to find the shower in your corridor is occupied? c) Forget about the shower, go back to your room and attempt to wash yourself over the sink. This morning, after much internal debate, I chose option c. Or I suppose I chose the first and third options really as by the time I’d decided what to do 5 minutes had gone by and the shower was still occupied. By that time I’d decided there was no point in going to the other shower cos that would only add another 5 minutes to the time already spent and make me late. So I washed myself over the sink, which resulted in lots of water on the floor but at least I don’t smell any more. And so it’s off to work I go.